Thank you for your interest in the Back Cove Contemporary Music Festival! The Festival is on hiatus for 2019. The tenth annual Back Cove Contemporary Music Festival comes to downtown Portland this May. 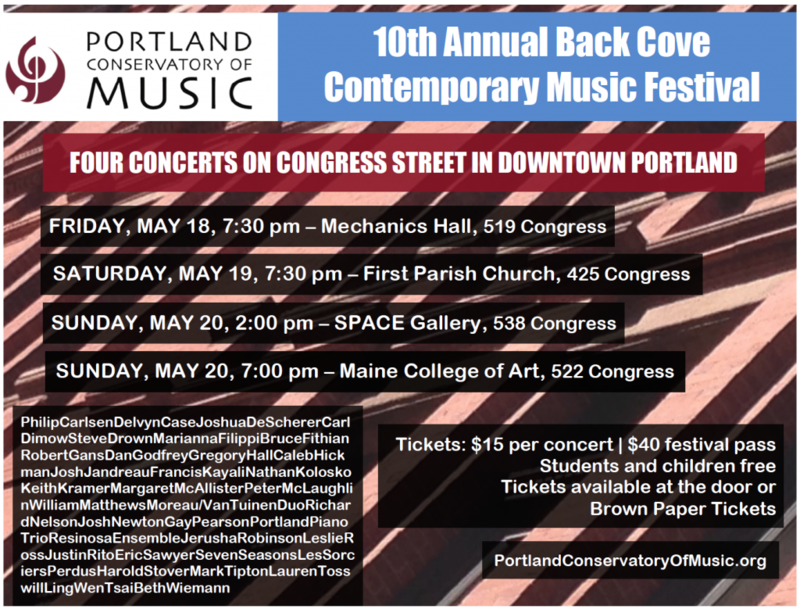 Under the sponsorship of the Portland Conservatory of Music, this year’s four concerts will all take place at venues on Congress Street, within steps of one another: Mechanics Hall on Friday, May 18, 7:30 pm; First Parish Church on Saturday, May 19, at 7:30 pm; SPACE Gallery on Sunday, May 20, at 2:00 pm; and the Bob Crewe Gallery of the Maine College of Art on Sunday, May 20, at 7:00 pm. As in previous years, the festival will feature an array of exciting new chamber music by composers from Maine and northern New England, most of whom will be present to introduce their pieces and interact with the audience. The performers include many of the region’s finest musicians, ranging from the Portland Piano Trio and the Resinosa Ensemble to the progressive quartet Les Sorciers Perdus and the Moreau/VanTuinen euphonium and percussion duo. Admission is $15 for each concert, or by festival pass, which is $40 for all four concerts. Students and children are admitted free. Tickets will be available at the door or through Brown Paper Tickets. Friday, May 18, 7:30 p.m. | Mechanics Hall, 519 Congress St.
Concert 1 at Mechanics Hall marks the debut of Seven Seasons, a recently-formed sextet devoted to new music conducted by Del Case. They will be performing works by Bruce Fithian, Dan Godfrey, Marianna Filippi, Greg Hall, and Jesse Feinberg. At the core of the group is the Portland Piano Trio, which will also be playing a piece for just the three of them by Richard Nelson. In addition, the concert includes a trio by Francis Kayali, and pieces for mezzo-soprano, piano, and cello by Beth Wiemann and Josh Jandreau, performed by Joelle Morris and the Resinosa Ensemble. Saturday, May 19, 7:30 p.m. | First Parish Church, 425 Congress St.
Appropriately for its location at First Parish Church, Concert 2 includes organ music written and performed by Harold Stover, as well as Bruce Fithian’s a cappella “Gothic Lord’s Prayer,” sung by the choir he has directed for the past decade, St. Mary Schola. The innovative Moreau/VanTuinen Duo premieres three pieces for euphonium and percussion written for them by Justin Rito, Margaret McAllister, and Philip Carlsen. The concert also includes solo piano music by Robert Gans, a duo for oboe and piano by Keith Kramer, and a trio for flute, piano, and bass by Gay Pearson. Sunday, May 20, 2:00 p.m. | SPACE Gallery, 538 Congress St.
Concert 3 moves to the SPACE Gallery, with works reflecting the genre-bending programming the venue is known for. Several composer-soloists will perform with electronic enhancements: clarinetist Beth Wiemann with vocoder, bassoonist Leslie Ross with Max MSP software, and singer-songwriter Jerusha Neely accompanying herself on cello with looping pedal. Neely will also perform in a piece for cello and electronics by SPACE’s music programmer Peter McLaughlin. Another soloist, bass player Josh Descherer, will incorporate homemade soundmakers into his composition. The versatile bass flutist Carl Dimow, without electronic tweaking, will push his instrument into unexpected territory. Philip Carlsen offers a new played-and-spoken string trio based on the poetry of Robert Bringhurst, and Mark Tipton’s multi-genre quartet Les Sorciers Perdus will fill SPACE Gallery with the collaborative, improvisatory spirit of the monthly “Gravity Sessions” series they have been hosting in Bayside. Sunday, May 20, 7:00 p.m. | Maine College of Art, 522 Congress St.
For Concert 4, the festival moves to the Bob Crewe Gallery in the lower level of the Maine College of Art, with several works on the program exploring connections between visual and performance art and music. Ling-Wen Tsai, sculptor on the faculty at MECA, presents a performance piece in collaboration with guitarist and composer Nathan Kolosko. Bill Matthews and Keith Kramer contribute electronic compositions inspired by the visual and musical legacy of Bob Crewe. Steve Drown, director of MECA’s music minor, performs with experimental vocalist Lauren Tosswill. Eric Sawyer and singer Kristen Watson present selections from his “Thirteen Popular Songs.” Finally, students enrolled in the Conservatory’s Karger College Prep program will take the stage, performing a composition by one of their own, as well as four pieces written for them by Francis Kayali, the program’s composer-in-residence this year.